This isn't Vasa related, but it is nautical related (loosely based on old maps of Europe that show sea monsters attacking ships), and the few people I have shared it with think it is pretty neat, so I thought I would share it here. It is a mechanical toy that I am making for my son Magnus. As you crank the handle, the ten body sections of the sea monster move up and down in a wave type motion as you might think a serpent-like sea monsters body would. The head turns 90 degrees from side to side as if looking at one ship and then the other, while the two ships go back and forth. I am going to model the tail of the monster to look like it has both of the ships wrapped in its tail. It was the first time that I have tried making wooden gears, and they work quite well. I will post more pictures and a video of it working when it is done. It is almost there. That's really cool Clayton! I like that you built it for your kid, I also build stuff with my two sons. I am also making some much simpler toys for him too at the moment. Great, he will love and have many memories of them! My kids love playmo and since theyare history interested we sometimes make cardboard buildings to their playmo willage. 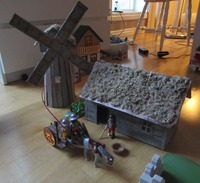 The windmill and house are inspired by medieval-1600 swedish original buildings. Great fun to do together with them and the kids like them more then the plastic playmo buildings they also have. Really cool! And the figures kind of look like lego ones. I used to build with legos a lot as a kid. Do you get some of your ideas from the open air museum Skansen in Stockholm? I have a photobucket album of most of the buildings there. They are bigger then Lego and have many cool themes. Skansen is great! Old houses can be seen here and there in Sweden, but the house is inspired by ones in Dalarna actually. The windmill is inspired by an old swedish design, likely they looked the same in other countries.Next project they want to do is a medieval church, loosely based on one in a town nearby. Very cool Matti! Your modelling skills translate to buildings too. I have often thought it might be fun to build a model or two in that genre. Architecture interests me a bit. Not really. It's the kids idea to build them and I just help them build their ideas. But I could definately enjoy making miniature buildings, one can get very realistic, judging by the ones seen at museums.